Kaity Veenstra, a University of Notre Dame senior majoring in architecture, has been awarded a Gates Scholarship to pursue a master’s degree at the University of Cambridge. Veenstra is one of only 39 students in the U.S. to be selected for the scholarship, which drew more than 700 applicants. Established in 2001 by the Bill and Melinda Gates Foundation, Gates scholars are identified by academics in their fields of study as exceptional researchers who have the ability to make a significant contribution to their intended disciplines. Award recipients also are recognized for their strong leadership skills and understanding of how their research can be applied to the challenges the world is facing today. As a member of Notre Dame’s Glynn Family Honors Program, Veenstra composed her senior thesis focused on campus master plans at Notre Dame, the University of Virginia and Harvard — an analytical research subject requiring a different approach than her architecture work. “It’s not the same kind of thought that goes into a typical design project,” she says. For her architecture thesis, Veenstra is designing a manufacturing trade school on a brownfield site formerly occupied by a Ford assembly plant in her hometown of St. Paul, Minn.
She is also a student analyst with GreenScale, a research program in the School of Architecture under the direction of Professor Aimee Buccellato. Veenstra analyzes “green” materials and methods alongside their traditional predecessors to generate data and draw comparisons to determine how to build the most sustainable structures. Veenstra has served as a board member of Student Activities’ Club Coordination Council, the 2012-13 president of the Student Association for Women in Architecture, and a residential adviser in Howard Hall. 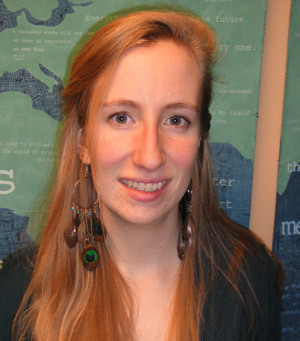 Veenstra’s Gates Cambridge Scholarship was made possible in part through her participation in Notre Dame’s Center for Undergraduate Scholarly Engagement (CUSE). CUSE provides undergraduate students in all the University’s colleges opportunities for research, scholarship, and creative projects. The center also assists them in finding faculty mentors, funding and venues for the publication or presentation of their work, and promotes applications to national Fellowship programs and prepares them in their application process. Originally published by Susan Guibert at news.nd.edu on March 04, 2013.